Dr. Armstead and her staff understand how important it is to be as accessible as possible to both current and future clients. If you have any questions about your treatment, or would like to set up an initial consultation, we can be contacted by phone or FAX at the numbers below during regular business hours: Monday-Tuesday, 8am to 6pm and Wednesday-Thursday, 8am to 5pm. We are closed on Fridays, Saturdays, and Sundays, but have an answering service ready to take your calls after-hours and on weekends. Dr. Armstead can still be reached through e-mail at Angela.Armstead.DDS@gmail.com. We welcome your questions, and will respond in a timely manner. The pride of our practice is treating our patients as not just patients, but people too. One of the many aspects of this is the ease of accessibility we offer to our current and future clients. Our office hours are on Mondays and Tuesdays 8am - 6pm, and on Wednesdays and Thursdays 8am - 5pm. We are closed on Fridays, Saturdays, and Sundays. If coming from the north, on I-79, take Exit 5, Big Chimney, turn right and continue to the four way intersection at Rt. 119. Turn right towards Charleston, and continue on for 1.5 miles. We are the long, green building on the left with ample street-level parking. If coming from the south, on I-79, take Exit 1, Mink Shoals, turn right onto Rt. 119 and continue on for 1.5 miles. We are located on the right in the long green building with ample parking. 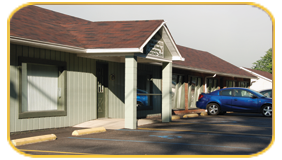 If you have any difficulty finding our offices, please don’t hesitate to call at (304) 343-2151.